Who’d a thunk a book with a train on the cover and set in the 30’s could actually be fun? Hi everyone! I’m back. Or attempting to be this year. And setting my standards way lower. Hello, quarter Cannonball, how you doin’? Anywho, I decided this year is going to be the year of seeing what’s up in kid’s books. Not BlackRaven’s level from last year (I read way too many kids books on repeat to actually analyze them), but intermediate readers. I go to the library every week, and spend my time wandering the children’s section, which at our library is ringed by the 9-12 year old kid’s books. Long enough to hold my attention, but simple enough that they’re easy to pick up and put down due to screaming beasties. And sometimes there’s pictures! Perfect. 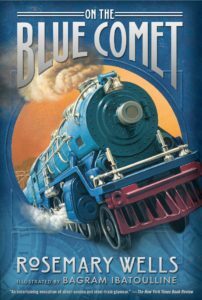 First up for the year is On the Blue Comet by Rosemary Wells. I honestly just picked it, because I liked the spine and thought I could start off the year with a little sci fi. And then I looked at the cover, and realized it’s a train. But with some surprising science fiction thrown in! The year is 1931 and Oscar Ogilvie Jr. is having a rough time. He and his dad lost their house, their model train collection, and now Oscar Sr. is off to California to try to find work while Jr. stays with his Aunt Carmen. Oh, and he’s almost failing math. Along comes a bum named Mr. Applegate who helps Oscar with math and visits to his beloved trains. After a Christmas Eve gone wrong Oscar is set upon a path of adventure, time travel, and full of famous characters. For picking an intermediate book at random in the library this was a winner to start off the year. It’s not an instant favorite, or even super memorable, but it was fun. It kept my interest the whole way through, laid out a complex enough story, but didn’t ask too much of me as an adult. For the kids it covers the depression realistically and introduces famous folks of the past in relatable ways. I had zero clue what to expect, and was pleasantly surprised. I can see this being a great book for a 9-10 year old who likes history, movies, and time travel. Now here’s hoping my next pick is just as delightful. Happy CBR11 everyone! Share the post "Who’d a thunk a book with a train on the cover and set in the 30’s could actually be fun?" Lover of books (specifically the kissing variety), kitties, tea, science, and kicking cancer's arse. Welcome back! Yay for lowered expectations.